404 pages | 45 B/W Illus. The theory and practice of management accounting should be seen within the context of varieties of global capitalism, to appreciate its role as a 'calculative technology of capitalism' which is practiced on factory floors, corporate boards, computer networks, spreadsheets, and so forth. This new textbook is the first to introduce the field from a rounded social science perspective. 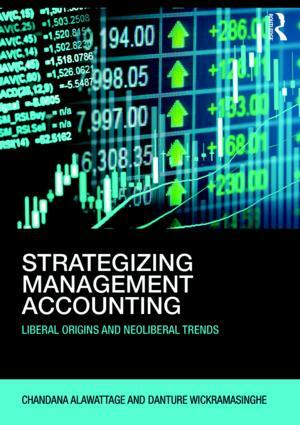 Strategizing Management Accounting offers a theoretical discussion on management accounting’s strategic orientation by accommodating two interrelated lines of analyses, from historical and contemporary perspectives. The book illustrates how 'new management accounting' has evolved into the form in which it exists today in its neoliberal context and how those new management accounting practices have become manifestos for the managers, as calculative technologies of decision making, performance management, control, corporate governance, as well as global governance, and development within various forms of organizations across the globe. Each chapter draws on Foucauldian analysis of biopolitics explaining how neoliberal market logic informs a set of strategies and mechanisms through which various social entities and discourses are made governable by considering them as biopolitical entities of global governance. Written by two recognized accounting experts, this book is vital reading for all students of management accounting and will also be a useful supplementary resource for those wanting to understand and research accounting's vital role in contemporary society. Chandana Alawattage is Professor/Chair in Accounting at University of Aberdeen Business School, UK. Danture Wickramasinghe is Professor/Chair in Management Accounting at Adam Smith Business School, University of Glasgow, UK.